Over the past few weeks I've been keeping track of costs of sea level rise when I've come across a number. They're starting to look real -- I'm up to $14.8 billion so far. 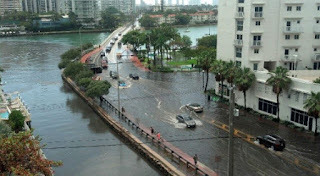 In Miami Beach, where only 20% of sea level rise is due to land subsistence, they’re spending $400 billion to address sea level rise, for seawalls, pumps and raising roads. Some of the money comes from all Florida taxpayers, and some of it comes from a $7/month increase in monthly stormwater fees for residents. New Jersey is spending (federal money) $300M for their Blue Acres buyout program. The state has bought 600 homes in danger of repeated flooding, using money from FEMA and US Dept of Housing and Urban Development. "Miami Will Be Underwater Soon. Its Drinking Water Could Go First," Christopher Flavel, Bloomberg, 8/29/18. "Sea level rise is already costing property owners on the coast," Chris Mooney, Washington Post, 8/20/18. "Surrendering to Rising Seas," Jen Schwartz, Scientific American, 8/1/18. You appear to have made the mistake of believing the headline, which you should never do. Nothing in the body of the article itself supports that assertion. Well, it says "Texas is seeking..." which they wouldn't do without being asked. How's this? "Gulf Coast oil and gas industries have reportedly been lobbying hard for protection against the rising tides." "Oil and chemical companies also pushed for more protection for surrounding communities to shield their workforces, but "not every property can be protected," said Sheri Willey, deputy chief of project management for the Army Corps of Engineers' upper Texas district." Weak, because of the anonymous "reportedly". Yes, but again: no direct quote, no attribution. And, of course, isn't about refineries, which is what you originally said. Is there no documentary evidence at all? 3. Natural, long-term sea-level rise. "The rate of sea level rise during the period ~1925-1960 is as large as the rate of sea level rise the past few decades." The Church and White data from CSIRO (here: http://www.cmar.csiro.au/sealevel/GMSL_SG_2011_up.html) gives a 1925-1960 slope of 2 mm/y, and a "last few decades" (1978-2013) slope of 2.5 mm/y. Similar, but not the same. And why exactly did Curry choose 1925-1960? Well, to find out I recommend you download the data and calculate sea level trends. Take 10, 20, 30, or 35 year periods and see how the trend in sea level rise after 1980 has been higher than any prior period (and, in fact, is increasing - sea level rise is indeed accelerating according to that data). Then consider again what Curry has said, and also consider that prior to 1960 we had a significant anthropogenic impact on warming, too. Thanks for the data Marco. It seems intuitive that global warming should be contributing to sea level rise, as glaciers tend to melt. You say that prior to 1960 we had a significant anthropogenic impact on warming, too. Is that a widely accepted POV? I'm no expert, but I had understood that IPCC models assumed that human emissions of CO2 were not large enough to have a significant effect on global warming prior to 1960. David, the IPCC has no models, it only summarizes the results from the scientific literature. The IPCC also is relatively cautious about the pre-1950 period, as we have less confident measurements of temperature and various forcings. However, the CMIP5 models all give a forced response to GHGs in the early 20th century. It is discussed in AR5 chapter 10 (WG1, of course). You mentioned: "3) Natural, long-term sea-level rise." What is natural, long-term sea-level rise? Here's a reconstruction of sea level for the last 2500 years. Do you have a source that shows the 2000 year trend is certainly positive? It doesn't look like the case from what I can find. You mentioned: "I had understood that IPCC models assumed that human emissions of CO2 were not large enough to have a significant effect on global warming prior to 1960." That is wrong at least in the way that you are interpreting it. So forcing prior to 1960 is two thirds that from 1960 to present. You can see it in GMT leading up to 1960. Layzeg -- my source was the article I cited by Prof Curry as well as some of her other articles. Her "long-term" trend period was 200 years. The realclimate period is 2000 years. Both of these could be correct for all I know. IMHO for the purpose of projecting a few decades, a 200-year experience period is more relevant than a 2000-year experience period. Thanks for the stats on the CO2 trend. Do you know if the increase in atmospheric CO2 prior to 1960 was caused by man's emissions? That is, in this period, with the burning of wood, coal and oil, did man emit enough CO2 to account for the rise in atmospheric CO2, or were there other causes as well? "For example, geological observations indicate that during the last 2,000 years, sea level change was small, with an average rate of only 0.0–0.2 mm per year." David, according to some numbers I gathered awhile ago, human CO2 emissions by 1960 were about 630 Gt CO2, which is 8% of cumulative emissions up to 2017. 48% from fossil fuels, 52% from land use changes. This doesn't include other GHGs. 3. Natural, long-term sea-level rise." In Florida there's also a fourth cause: the slowing down of the Gulf Stream. Her "long-term" trend period was 200 years. Looks like she's subtracting the early anthropogenic trend from the current trend. Silly. If the preindustrial trend was 0.0–0.2 mm per year and current sea level rise is 3.0 ± 0.4 then #3 (long term trend) accounts for somewhere between 0 and 7%. "Using a 25-y time series of precision satellite altimeter data from TOPEX/Poseidon, Jason-1, Jason-2, and Jason-3, we estimate the climate-change–driven acceleration of global mean sea level over the last 25 y to be 0.084 ± 0.025 mm/y2." R.S. Nerem et al, "Climate-change–driven accelerated sea-level rise detected in the altimeter era," PNAS, February 12, 2018. I'm not convinced by that one. Doesn't natural variability dominate over that timescale? I suppose time will tell. "I had understood that IPCC models assumed that human emissions of CO2 were not large enough to have a significant effect on global warming prior to 1960." IPCC models -- that is, the models cited by the IPCC -- don't make such assumptions -- they CALCULATE the effects. They don't assume them. David -- I stand corrected. But, do you know whether or not the IPCC models calculated that man's emissions did not have much of an effect on global warming prior to 1960? Almost half of the anthropogenic forcing due to CO2 occurred prior to 1960. Of course it had quite an impact. It's possible that warming prior to 1960 was not statistically significant. That doesn't mean what Judith wants you to think it means. It doesn't mean insignificant as in negligible. It just means not statistically significant relative to the noise. Warming would be considered significant if there is less that a 5% chance that natural variability and other factors could account for the observed trend. If it's not found to be statistically significant it doesn't mean that it was found to be insignificant. It doesn't mean the warming didn't happen. It doesn't mean that other factors account for the trend. 40% of our emissions occurred before the 1960s. We've warmed about 1.2C so far and about 0.5C of that occurred prior to the 1960s. That's about 40%. Judith want's you to subtract 40% of the warming trend and ignore 40% of our emissions. It's nonsense. David in Cal: What Layzej wrote.